It's a little ironic that I picked up Karen Harrington's Janeology right after Mother's Day, considering it's the story of a mother who drowns her son. Like the book's title character, all of us moms have felt weary and overwhelmed. In fact, most of us have probably uttered the words "I'm going to kill that child" at one point or another. Janeology asks the question, What happens when a mother goes from venting to actually committing falicide? The story is told from the perspective of college professor Tom Nelson, whose world shatters when a police officer interrupts his lecture, urging him to go home immediately. Shock envelops him as he learns these chilling facts: his wife, Jane, drowned the family dog, then held her twin toddlers under water, killing one and leaving the other on the brink of death. When Tom demands to know why, his wife casually replies, "I had too much. I was done being a mother, you know?" (15). Jane's subsequent trial ends with a verdict of "not guilty by reason of insanity." Committed to a mental health facility, Jane descends further into madness, while Tom tries to pick up the pieces and parent his remaining child singlehandedly. Three years later, Tom is horror-struck to find himself on trial. The charge: failure to protect. Awash in guilt over his son's death, Tom dissects his marriage, wondering how he could have missed the signs of Jane's mental illness. Sure, she had been down after a miscarriage, but at what point had she turned dangerous? Had he somehow missed the warning signs? Noticed them, but denied them? Is he guilty? Tom's lawyer, Dave Frontella, proposes a strategy: If the defense can find evidence of mental illness in Jane's family history, they can prove Tom's innocence by showing she was predisposed to suffer a mental break. To achieve this end, Dave introduces Mariah, a clairvoyant relative of Jane's. The psychic instructs Tom to bring her an antique trunk Jane inherited from her mother. Using the objects inside, Mariah channels Jane's ancestors, finding cold mothers, "oblivious fathers" (133) and "parental models of inaction" (114), as well as deeper psychiatric problems. All of it proves Dave's point, but will it be enough to convince a jury? Will it be enough to wash away Tom's guilt? Can it - can anything - fully explain Jane's break? Each time a mother kills her own child, I want to know why. What could possibly make a woman snap like that? I was hoping Janeology would offer a Jodi Picoult-like dissection of the killer, allowing me to understand and even empathize with Jane. But, it doesn't. In fact, Jane's voice is never heard. The little bit we learn about her comes from Tom and a clairvoyant's version of her family history. In fact, the whole Mariah thing rubbed me the wrong way. I actually love the idea of telling a story through family heirlooms, but not in the middle of a legal thriller. It just didn't fit. I kept wondering what Mariah's "visions" of Jane's ancestors had to do with the story. Plus, who can trust the accuracy of a psychic's visions? I sure don't. Some of the chapters about her family (especially her mother) shed light on Jane's psyche, but most of them don't. What results is a study of Jane (Janeology) using only secondary, tertiary and even more remote sources, when what we really crave is information from the primary source. The bulk of the book is taken up by these glimpses into Jane's family history, but they have very little bearing on its conclusion. In fact, the book ends ambigiously, dissatisfactorily. I did, however, love the Epilogue. While I was disappointed with the format of this novel, I still think it's a good read. Harrington writes well, especially when penning character sketches. She chose a fascinating subject, and she kept my interest with her examination of it. Unfortunately, the psychic subplot felt disparate, making the book ultimately dissatisfying for me. 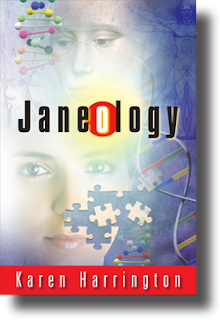 Thanks for posting your perspective on JANEOLOGY. Believe it or not, I did enjoy reading your thoughts! No, really I did. As an author, it's always interesting and beneficial to get a variety of reactions about a story, particularly what different readers bring to the page. That exchange is what I love about all books! I'll definitely be back for more of your reviews now that I've discovered your site! Hi Karen! Thanks so much for commenting. Janeology was actually really hard for me to "grade." I wanted to give it a high rating because I thought it was interesting and well-written, I just could not get over the fact that the clairvoyant parts felt as if they belonged in a different book. The idea of telling a story through heirlooms intrigued me, I just would expect to see it in a different kind of mystery (like, a woman moves into a new home that seems haunted, so she wants info on the family that built it, or someone moves back into a family home and learns the truths about their ancestors through items in the house, etc.). I guess because of the way the book is set up, I expected a straightforward legal thriller, so the psychic stuff just didn't jibe for me. I'm also curious why you didn't let Jane "speak" in the novel - that was probably my biggest issue with the story. Anyway, thanks for your good-natured response to my review. I really think your writing is excellent, and I look forward to reading more of your work (you are working on a second novel, right??). I completely understand your point of view on JANEOLOGY. What's interesting is that many folks are divided on the psychic element of the book; it's a real love/hate part of it. That's okay. I've learned a lot from people's reaction to this concept and - like most writers - have parts of the book I'd love to go back and write! Lessons for the next book, which is in the works and nearly finished. Thanks for inquiring! When I wrote the book, the most important theme was the way in which a husband isn't in tune with his own wife. The signs he refuses to see because he can only "see" her the way he did when he first met her. That's one of the reasons Jane is in the background. But the most important reason is the Hitchcock Effect: that is, the idea that the monster or ghost in the story is the scariest because they lurk at the edges of the story and you never know exactly when or how they will appear. Jane appeared 3 times in the novel and I liked how it played out. Maybe that idea worked for some. Maybe it didn't, but it sure was fun writing. Keep up your good, honest work. You have a lot in common with the writers you review as you are also putting yourself out there for critique. But that's the dance we do! I agree with Karen about the need for honest criticism - as long as it is done in a way that is beneficial to the author and those who would read it and not just a slam-fest on the book and/or author. I think you did a good job in presenting the book as you saw it, pointing out the high points and the things that presented question marks for you. And you did it in a way that was not demeaning to the author. As a reader, I appreciate that. Karen, still can't wait to read this book - it is at the top of my tbr list. I'm working on this book right now. When I finish it, I'll come back to read your review and see what you thought of it.